Renowned faculty members in the Department of Vocal Performance play a vital part in opera studies through numerous course requirements and offerings. These include private lessons, vocal coachings, diction, stagecraft, movement, history, audition technique, media, production, and performance. Master Classes by guest artists are given throughout the academic year in all areas of opera discipline. A complete list of Master Class guests can accessed on this website. 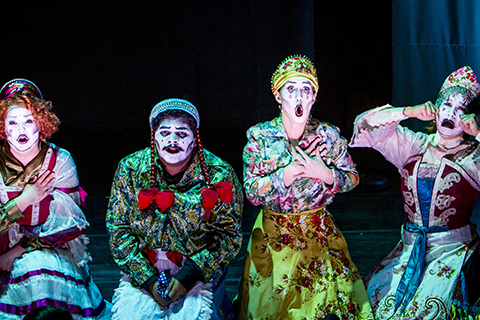 Participation in Frost Opera Theater is arranged in tandem with Opera Theater ensemble. All students attend casting auditions for MVP 580 productions and may be cast in opera chorus and role assignments. M.M. and A.D. students register for an opera ensemble each semester during their course of study. DMA students register for an opera ensemble in two semesters with the option to register in all semesters as an elective. This stagecraft and movement ensemble meets twice a week. Participation in Frost Opera Theater is arranged in tandem with Opera Theater ensemble. All students attend casting auditions for MVP 680 productions and may be cast in opera chorus and role assignments.